Selling a house that has been our home for 35 years is not always easy. We have had the pleasure of working with Kristie Dinsmore through this process. From the beginning she guided us with professionalism, a superb knowledge of the real estate market, and a strong work ethic. She is very thorough and organized, answered all our questions in a timely manner, and offered her expert advice when needed. [and it was needed!] More than that, she is extremely easy to deal with, very personable, and she gave us positive outlook on our home and the sale. We would heartily endorse and recommend Kristie for any real estate transaction in the area. Thank you, Kristie! Kristie is one of the nicest person I have met. She is extremely helpful and kind. When I was interviewing realtors to finalize one to sell our house, I wanted to get a couple of jobs done around the house - Kristie was the only one who passed on the information about other businesses to me, other realtors mentioned they can refer some businesses to me. She also actually took care of a small point that came up during inspection - yes she did since I was unable to come back to NH to get that fixed. Her professionalism and knowledge about the Windham real estate market reflected in her report which she presented to me on her first meeting. The marketing material she created for the house was impeccable. Did I mention she even came by to help me get inside my own house on a Sunday when I locked myself out? If she was licensed in MA I would have hired her for all my future real estate requirements. Kristie was absolutely amazing to work with! She was very dedicated to helping us sell our home and purchase our new home! Kristie was always available to answer questions over the phone or through email and was in contact with us about everything going on. Her materials she had made for our open house were detailed and beautiful. She is a hardworking and caring person and we loved working with her! Family friends had recently sold their home through Kristie and were very pleased with the end result. After living in our home for thirty years, we were looking for a realtor with all the strengths that Kristie possesses and we called her. Kristie's knowledge of the market and professionalism in her approach was a great help to us in selling our home. Kristie is a dedicated agent and was very responsive to our needs as sellers. We trusted her in our effort to sell our home and she didn't let us down. It was a pleasure working with her. We were recently fortunate to work with Kristie Dinsmore both in selling our home of 43 years and purchasing a lovely condominium to meet our needs in retirement. Kristie was recommended to us by some friends who sold their home in town a few years ago and were extremely satisfied with the level of service she provided them. Even though this is our first sale and purchase of a home in New Hampshire in many years, we recently purchased a home in Florida and dealt with realtors in selling both of our parents' homes in Massachusetts after they passed away. Kristie could not have been more professional, dedicated, and accommodating in her interactions with us. She patiently showed us many homes beginning in the spring of 2017 when we first thought about selling our home and moving to a condo, and she assisted us in preparing our home for sale. We had strong ties and were emotionally attached to the home we sold after such a long period of living in it. The written description that was presented when our house went on the market was very detailed and positively portrayed how well the house and property were cared for, as well as the most outstanding features of the house. Kristie's attention to detail was remarkable. She was very available and always responded to our questions and concerns in a prompt manner. She kept us well informed about any outstanding issues regarding the purchase and sale of both the home we were selling and the condominium we were buying. Kristie's extensive experience and proficiency in knowing Windham and the surrounding communities were especially helpful to us in settling in our preferred location. She was also cognizant of and honored our price range regarding the condominium we purchased. She has an excellent grasp on the real estate market and the value of homes in the area. While Kristie's attention to detail is remarkable as indicated, she was also very flexible in dealing with us and appears to have excellent relationships with the many collaterals, e.g., lawyers, home inspectors, etc. who are necessary in the process of buying and selling a home. We could not have been more pleased with Kristie and Dinsmore Associates in the recent sale of our home and purchase of a condominium. We highly recommend her without any reservation to anyone contemplating the purchase and/or sale of a home. Kristie has a well-deserved reputation for professionalism, community knowledge, and service above and beyond what is expected. In selling our home, she created a package that accurately reflected the benefits of living in our community and the beauty of our much-loved home. She knows the market and she knows how to get the job done for both buyers and sellers. She was a pleasure to work with, and we have already recommended her to others in the neighborhood looking to downsize. You could not ask for a more caring real estate agent. Deborah Walsh- Kristie sold their home in Windham in less than 5 days for $20,333 over asking price. We couldn't be happier with Kristie as our realtor. The marketing of our home was impressive and very effective. We had multiple offers over asking less than 1 week after listing. Kristie guided us every step of the way through the process and dealt with our 2 indoor rescue cats and our dog beautifully ... they all loved her! She respected our property and we had absolutely no issues with showings. The open house was very well attended and yet the house was exactly as we had left it. Kristie handled all the logistics of selling in a timely manner, always came to our house for signatures or to drop off / pick up documents, keys, etc. (so convenient), and her communication on all matters was spot-on. Selling a home is stressful, but Kristie's expertise and tireless attention to details made the process and overall experience very smooth. She guided us in negotiations, shared her knowledge of the market, and connected us to people and businesses who could help us with issues ... specifically, the remediation of an oil tank we had buried in the ground for 37 years! She is well connected and the photographer she hired to take pictures made our home look beautiful in the advertising. He used a drone to take pictures from the air which showed our property in a whole new light. We couldn't believe how many publications our home was presented in ... newspapers, magazines, and the internet. We communicated with Kristie via text, email and phone calls day and night, weekdays and weekends ... she was always there 24/7 to answer our questions. We are extremely grateful to Kristie for selling our home ... well done !!! Ron and Donna Schuler --Kristie Sold their Windham home in less than 7 days for $15,100 over asking price. My husband & I have worked with Kristie on lake front property. She knew when the time was right to sell. Everything was done in a timely manner and the photos and brochure were the key to a quick sale with many offers to choose from. It was a pleasure to work with Kristie - Customer Service is my # 1 have to have and Kristie tops that hands down!!!!!! Suzie Swensen. --Kristie sold their waterfront home of Cobbett's Pond in 7 Days for $42,000 over asking price. Kristie was pleasant, helpful, extremely knowledgeable and always available in my search for a home. Having worked with other realtors, I can say with utmost confidence that Kristie is a cut above the rest. Her local knowledge and various construction and inspection connections were second only to her experience and willingness to explain everything that comes up in the buying/closing process. Cannot say enough good things!!! Chris Peretti --Kristie represented Chris as a first time buyer. Purchased a beautiful antique colonial in Milford NH. 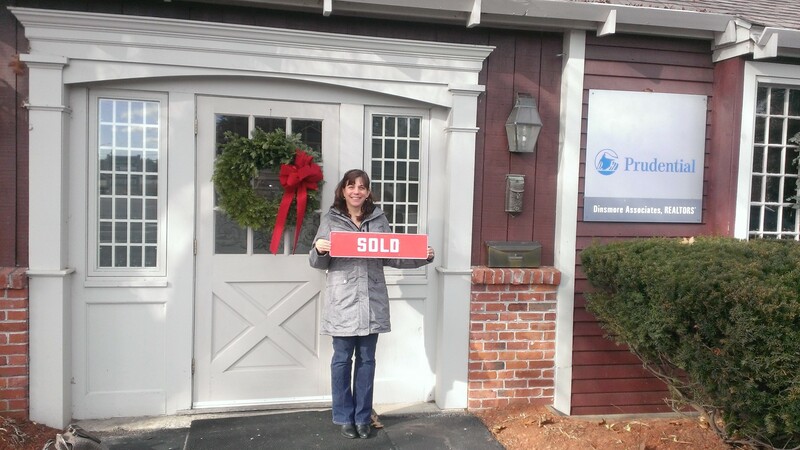 Dr. Kaiser and Dr. Besiana Liti --Kristie represented them in the purchase of a home in Salem NH. Kristie Dinsmore is a top notch real estate agent with expertise in the Southern New Hampshire area. She assisted me and my husband in purchasing our first home. As an experienced real estate agent, Kristie knows the market and didn’t stop working until my husband and I closed on our home in a location we are very happy with. She was available at a moments notice to answer questions and schedule showings. She also worked so well with everyone involved in the real estate transaction. Her knowledge of the entire home buying process made me feel comfortable enough to put complete trust in her to assist me in finding a home I love while getting the best deal possible. She was always honest and gave her expert opinion on a home without pushing us to chose one home over another. It was evident that our happiness was Kirstie’s number one priority. With every interaction she had a unique way of making us feel like her number one clients. One of the things I loved most about working with Kristie was the rapport she had with others in the business and the quick rapport she built with those people she had never worked with before. I would definitely work with her again and highly recommend her to anyone buying or selling a home. Laura Bennett --Kristie represented them as their buyer agent. They purchased a home in Londonderry NH. Angela Davis --Kristie sold her Windham home in 4 days for $6,100 over asking price. Kristie really took the time to understand exactly what I was looking for. As a first time home buyer I needed some guidance but I also knew I probably had some different "must haves" than most. By the third house she had learned exactly what I was looking for and I had learned what I should be looking for. Long story short Kristie found me a perfect home that was practical and suited all of my needs (and then some!) for under my initial budget! I've been a happy home owner for almost a year and wouldn't have done it any other way! I highly recommend Kristie due to her professionalism, expertise, and personal touch. Joel Bergeron --Kristie represented him in the purchase of his first home in Salem NH. Kristie has been extremely responsive and easy to work with. We got lots of great advice and information. We always felt we had her full support and attention. She negotiated every little detail to ensure we were fully protected during and after the purchase of our property. She has great knowledge (laws, technical, and of the town), very solid professional experience. Romolo Pallini --Kristie represented him in the purchase of a waterfront lot on Cobbett's Pond, Windham NH. This is to thank Kristie Dinsmore of Coldwell Banker Dinsmore Realty. We recently sold our home of 30 years. As you can imagine it was stressful and emotional. Kristie was extremely thoughtful, caring and extremely knowledgeable. She led us through the process and gave advice based on her solid experience. Our home sold quickly. Kristie was extremely supportive and very accessible throughout each step. We are very grateful to her and her skills. Thank you so much for you guidance and knowledge. Kristie. We are very sincere. We thank you. Sold a house on Farrwood Road in Windham for $450,000. 20 Days on the Market. We are so happy we hired Kristie to represent us in the sale of our home. Thanks to her good advice and in-depth knowledge of the local market we sold our house in 6 days for the price we wanted. Kristie's interpersonal skills make her a wonderful realtor. She is a diplomat, a facilitator and a mediator. She also enjoys good relationships with other local realtors. These traits get deals closed. We have lived all over the country and hired many good realtors as we bought and sold. Kristie ranks right up there with the best. Sold a single family home in Windham for approximately $650,000. I found Kristie through a google search of Windham Realtors, I live in the Boston area. She quickly returned my emails and calls and it was obvious at our first meeting that she was very knowledgable of the real estate market in the Windham NH area. We were very inexperienced in real estate, selling camps on a small pond. She had experience with these type of properties and her advice saved us hours of work and expense. We needed to sell quickly, her advice was spot on for attracting interested buyers and for determining which offer was the best for us. I am grateful to Kristie Dinsmore for returning my first email, the result was an excellent selling experience. Working with Kristie at Prudential Dinsmore was great. She knows the area very well and had done all her research before our first meeting with her. I knew exactly what to expect based on similar sales and I had a buyer in less than a week. (Spoiler Alert!) She also surprised everyone at the closing table with a little gift. Thanks so much, we are loving the house. "We recently bought an amazing home in Windham with the help of Kristie. We found her through a Google search which led us to her website and couldn't have been happier! She was thorough, efficient, and savvy through our entire home buying process. She gave us honest and very helpful advice regarding mortgages and inspections and other important decisions along the way. She was very responsive and easy to communicate with at every step. She also helped us sell one of our homes, and made that process extremely smooth and efficient. We highly recommend her to anyone looking to buy or sell their home!" Bought a house in Windham | Sold house on 47Melendy Road, Hudson. Sold for $226,900 in 15 days. ...We certainly appreciated working with you and the quick sale that resulted from your guidance and experience. "OUR EXPERIENCE WITH KRISTIE DINSMORE WAS PROFESSIONAL, ENJOYABLE AND SUCCESSFUL!! WAS THE RIGHT AGENT FOR US AND KNOW SHE WOULD BE AN ASSET FOR YOU." Sold home on Londonderry Road in Windham. Sold home for full price $329,900. 6 days on market. 10/30/2015. "We had a great real estate selling experience with Kristie as our agent. She has extensive knowledge of the local market and is extremely easy to work with. Kristie was always quick to respond to calls as well as emails. Highly recommended!" Sold home on 5 Chestnut Street in Windham for $975,000. 11/04/2015. Sold home on 24 First Street, Windham. Waterfront on Cobbett's Pond. Sold on October 26, 2015 for full price ($459,900) after being on the market just 7 days. We had the opportunity to interview many realtors, but our first choice was easy. Kristie was straight forward, easy to work with and had our home sold in 3 days. From Listing to closure, she was there every step of the way, communicated effectively and managed the process. We would highly recommend her for a listing agent or buyer broker. Sold home on 10 Glenwood Road in Windham on May 14, 2015. Sold for full price ($599,900) and was on the market for just four days. Sold a home in Windham May 18, 2015. List Price $319,900 Sell Price $329,900 6 days on the market. "Kristie was the best realtor we have worked with in all of our real estate transactions. We have lived in a few cities and by far, Kristie is the best. We called Kristie (finding her from a website search); from the first conversation to the closing table, we truly had a great experience, and were completely impressed. Kristie listens to her clients and puts that information to use on finding options for her clients, that match their needs, within budget. Kristie knows the area, knows the market, and has extensive knowledge of the entire home buying process from start to finish. Kristie looks out for her clients best interests, she is responsive, timely, and you know exactly what to expect when you begin working with Kristie. We can't say enough good things about working with her. She made our moving experience less stressful, putting us in touch with other great contractors, lenders, - She knows everyone in the business that provides quality work. I would highly recommend Kristie to anyone, we will definitely be using her again!!" Sold a condominium in Hardwood Heights in Windham NH. "Thank you so much for helping us make our dream home a reality! We are so in love with our new home..."
I contacted Kristie 8-9 months prior to purchasing a home. Kristie is very knowledgeable about the area and surrounding towns and the real estate process. I gave her my checklist and she helped me look for months. This one was too big, that one was too expensive, the other one was a dump, until finally we found "the one", of which some items were not on my checklist! She helped me to negotiate the price by offering suggestions as to what were legitimate issues and what were frivolous. She then kept the process moving, advising me of what I needed to do next and giving me contacts for the process. She was very responsive, never hesitant about getting on her phone. At all times I felt she was on my side and looking out for my interests.